I love to read anything about the brain! Improving the brain, how it works, what new areas they’ve learned about. Three years ago I wasn’t very interested in knowing much about the brain but after my sons stroke it became very important to me. There are so many areas that neurologist don’t understand. I have been told over and over that no one even knows why my son can’t talk. He should be able to. There is some part of his brain that isn’t making the connections and even after 2 regular MRI’s and 1 even higher tech MRI no one can say for sure why or what is going on in there. It’s also why I love to read about success stories. The one in a million ones. It’s because I know that someday my son will be one of those stories. Call it mother’s intuition if you will but I do. It’s not hope it’s a very peaceful assurance that he will one day talk again. In the mean time I do everything I can to find ways to help him achieve that goal. 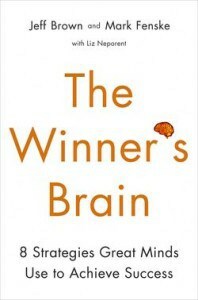 The Winner’s Brain contains several success stories from people who did the unthinkable. People like Carrie Strug and Stephen Harris. The Winners Brain has two sections. The first is understanding the Winner’s Brain. It gives a brief tour of the brain and the history of modern neuroscience. The second part of the brain is broken down into eight win factors. These include Self-Awareness, Motivation, Focus, Emotional Balance, Memory, Resilience, Adaptability and Brain Care. I have learned a lot of technical “stuff” during our recovery time. What makes this book so enjoyable is that it’s not too technical. It does more than skim the surface but in a way that anyone can understand. There are exercises for improving your brain and ways to help you change how your brain functions. There are tips on the right type of fat and foods to eat to keep your brain healthy. The authors talk about how to get better sleep so that your brain can function better. There are so many helpful tips and reminders of how to be a better person over all that this is a book I feel everyone could learn something from reading.